There is a group of environmental friendly, cultivated farmers insisting on natural and non-pesticide farming to grow healthy fruits and vegetables. Healthy diet, natural agriculture products, garden with plentiful eco-friendly environment and green architecture, those are the key principles of setting up the style of LaoWu Home Stay. You are always welcome to join us and experience our leisure way of life with cycling, jogging, yoga, music or just relax and read. The farm owner insists in using natural and organic material to plant their mushrooms for more than 20 years, the advantageous of the temperature difference between day and night around the mountain help to cultivate mushrooms with intensive flavors. With support from biotechnology control and steam drying method, it is possible for us to preserve most potent nutrient and aroma of our mushrooms. We are located at the north ridge of Yushan Mountain Range and blessed with unparalleled natural environment. We started organic method of cultivation since 2004, our lemons, peaches and plums are all certified by National Chung Hsing University after 10 years of hard work. Nevertheless, we are still comitted to provide the most comprehensive fresh organic fruits and vegetables to the community. Mr Zhang comes from a farming family for several generations. The knowledge of pesticide safety is inadequate in the early years, the elder brother had suffered from the toxic and passed away; along with frequent pesticide poisoning incidents made him realized that only by cultivating healthy crops can make life better. Thus, he made the most important decision in his career life to change the method of farming. Then he joined Republic of MOA International Beauty and Natural Ecological Foundation at 1983, from there he learnt the practices of sustainable agriculture management, starting from water quality control, their hard work has paid off by obtaining organic certification at 1989. The grapes from the farm has earned good reputation all around. The name of the farm comes from a Chinese character “Lazy” and the word can be broken down into 2 different characters, “heart” & “depend”. When these 2 words are put together, it transforms the meaning to “trust”. The owner refuses to use pesticide and chemical fertilizers, so that the customers can trust him more and consume with peace of mind. The owner has been following KKF’s natural & friendly farming methods. This helps the fruits and vegetables in the farm to grow healthier as well as to keep a sustainable environment. RICE, CORN, CABBAGE, GREEN ONIONS & CHERRY TOMATOES & OTHER ORGANIC FRUITS AND VEGATABLES. Being surround by woods, across the trees is the terrace of the farm.The predecessors of Mr Huang had been cultivated here as early as the beginning of last century. 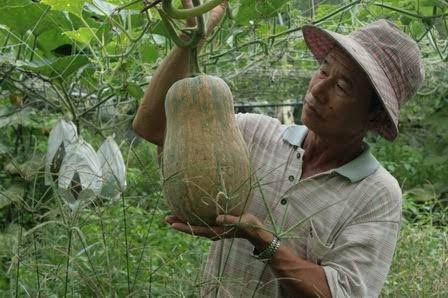 By now, Mr Huang has transformed it into a mixture of afforestation and natural farming to produce healthier fruit and vegetable. GRACILARIA, PUMPKIN, BITTER GOURD, SEASONAL VEGETABLES.